SAN JOSE, Calif. (AP) - Brian Campbell had been trying this particular spin move since he and Joe Thornton were kids growing up in Ontario. It never really worked until Monday night, when the Sharks' newest defenseman finished a win for his new fans with a tantalizing preview of coming attractions. Thornton had two goals and two assists, and Campbell put one last flourish on an evening of sublime hockey skill with the final goal in San Jose's sixth straight victory, 6-4 over the Montreal Canadiens. Campbell, acquired six days ago from Buffalo, left his teammates slack-jawed when he pinwheeled through the slot and fired San Jose's final score past beleaguered Montreal goalie Carey Price with 1:39 to play. The Sharks expect big offensive numbers from Campbell, and the two-time All-Star clearly has the means to produce them. "He told me he was going to pull that trick out," said Thornton, whose pass set up Campbell's goal. "He's been doing it since age 10, so that's no different. He's been like that since I've known him. ... There was just so much skill out there on the ice tonight. They obviously have so much skill on their team, and it was just two powerhouses going at it." Thornton and Jonathan Cheechoo also scored dazzling goals for the Sharks, who lost none of the momentum acquired on their eight-game road trip. Enforcer Jody Shelley scored the go-ahead goal late in the second period, and captain Patrick Marleau also scored as the Sharks added to their longest winning streak of the season. Evgeni Nabokov made 27 saves in San Jose's first home game in 2 1/2 weeks. Both teams were playing their third games in four nights, yet the numerous skill players on both sides didn't seem weary - not with playoff positioning on the minds of both clubs. "The crowd was loud, and it was almost a playoff atmosphere," said the soon-to-be free agent Campbell, who couldn't hear the chants of "Sign him! Sign him!" from the stands. "It's nice to score, but the win is really nice. We've got games in hand, so we've got to take advantage of those." Tomas Plekanec scored two goals and Ryan O'Byrne got his first NHL goal for the Canadiens, whose three-game winning streak was snapped in the opener of a four-game West Coast road trip. Price made 33 saves in his worst performance since the Eastern Conference co-leaders traded Cristobal Huet to Washington, turning over their fortunes to the 20-year-old rookie goalie. "They go to the net hard, and I just have to work harder," Price said. "That's how you score goals in this league." Though the Sharks are among the NHL's best defensive teams, the clubs played a wide-open game featuring three ties before Shelley put the Sharks ahead 4-3 with his first goal of the season late in the second period. 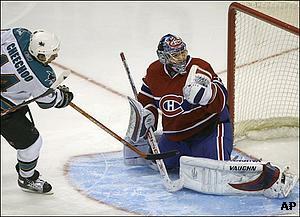 Cheechoo then scored early in the third before San Jose survived Maxim Lapierre's late goal and a Montreal power play. "We did some really good things, and we did some really bad things," Montreal coach Guy Carbonneau said. "We're playing well, but we still have a young team that's learning to play on these occasions. ... In the papers, everyone was talking about our defense and our goaltender, and we saw the results tonight." Sharks defenseman Craig Rivet had an early assist in his first game against the Canadiens, who traded Rivet to San Jose last spring for defenseman Josh Gorges, who started for Montreal. The Sharks were uncharacteristically sloppy, taking a handful of foolish penalties to aid Montreal's vaunted power play. But it went 0-for-7, including its last attempt in the final four minutes. 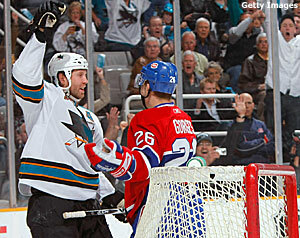 "Both teams had an incredible amount of energy," Sharks coach Ron Wilson said. "It was kind of sloppy. There were mental mistakes by players on both teams, but people were opportunistic. O'Byrne, a rookie defenseman called up in early December, got his first goal in 22 games with a long slap shot through traffic late in the first period. Thornton put the Sharks back ahead in the second period with a 4-on-3 power-play goal for the 27th multigoal game of the former MVP's career. After Plekanec tied it again, Shelley scored his first goal since Feb. 25, 2007, when he rattled home a long shot from the blue line. Cheechoo then embarrassed Gorges with a spectacular move and a quick shot over Price's shoulder, clinching his fourth straight 20-goal season. Notes: Sharks C Jeremy Roenick missed the game with the flu. ... San Jose F Tomas Plihal picked up his first NHL assist on Shelley's goal. Plihal has played 16 games over two seasons. ... 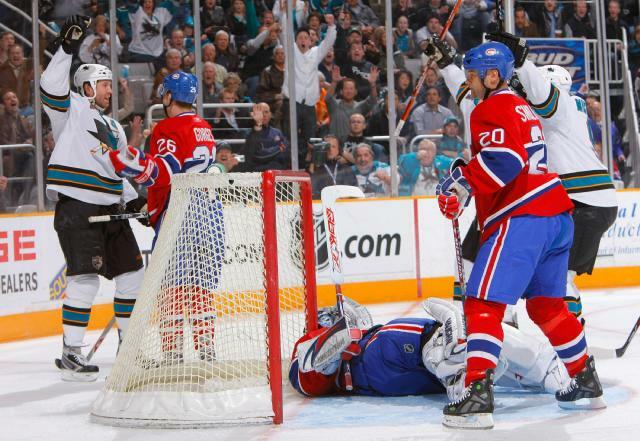 Moments before Thornton's power-play goal, he took a shot that bounced off Price - and the puck was left sitting on its edge squarely on the goal line before a Montreal defenseman cleared it.